Cabalist; lived in Safed early in the sixteenth century; a contemporary of Moses di Trani. He is chiefly known as a commentator, and was the author of notes on Jonah Gerondi's ethical work "Sefer ha-Yir'ah," and on the same scholar's "Dat ha-Nashim," addresses to women, both these works being published, together with the "Iggeret Musar" of Solomon Alami, by Shabbethai b. Isaac (Cracow, 1612). 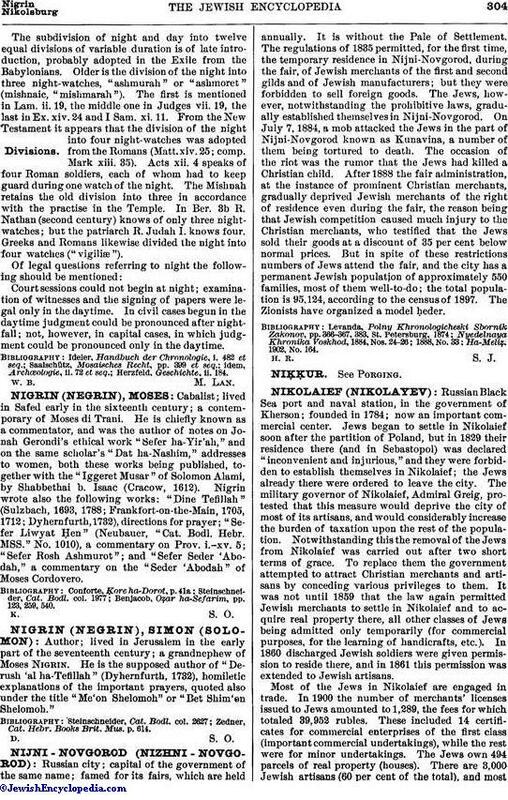 Nigrin wrote also the following works: "Dine Tefillah" (Sulzbach, 1693, 1788; Frankfort-on-the-Main, 1705, 1712; Dyhernfurth, 1732), directions for prayer; "Sefer Liwyat Ḥen" (Neubauer, "Cat. Bodl. Hebr. MSS." No. 1010), a commentary on Prov. i.-xv. 5; "Sefer Rosh Ashmurot"; and "Sefer Seder 'Abodah," a commentary on the "Seder 'Abodah" of Moses Cordovero. Benjacob, Oẓar ha-Sefarim, pp. 123, 259, 540.